There is a moment each year-usually in late winter-when I’m stopped in my tracks on the way from the house to the barn where I write. It’s not a striking show of flowers that’s responsible for arresting my steps, although the snowdrops are, at last, beginning to drip with their milky-white flower buds. Instead, it’s a heavenly fragrance that gives me pause and it comes from what at other times of year would appear to be a pretty unremarkable evergreen. 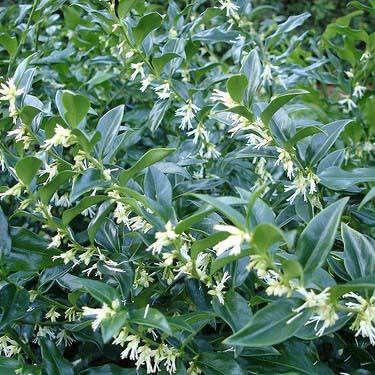 Sarcococca, the Christmas box (although it seldom manages to flower in the festive season with me), does look a bit like box, although its leaves are glossier and more pointed. In summer, it makes a pleasant foil for border perennials, either in full sun or dappled shade, but in late winter, its branches are wreathed in small, white, whiskery flowers. They’re not, in themselves, what even the most generous of gardeners would call spectacular, but they give off the sweetest fragrance, which floats on the air even on the coldest of days. You’ll be stopped in your tracks a couple of yards beyond the bush, and then you must retrace your steps to discover the source of your pleasure. There are several species. I have two. Sarcococca confusa is the glossier and brighter green of the two, growing with me to about 3ft high (it’s said to grow to double that height) and as much wide. Sarcococca hookeriana var. digyna is a 6ft wide and 3ft high suckering bush, which has longer, narrower leaves of a slightly darker green, on reddish stems whose ruddiness is carried on into the calyx that cups the equally whiskery flowers that, in both species, are composed entirely of stamens. Round black berries, the size of dried peas, often follow the flowers. Both make attractive, low, informal hedges that are a pleasant change from box or teucrium, and their winter perfume makes them indispensable garden plants. The winter-flowering honeysuckle is happy to release its perfume if you push your nose in and sniff its flowers close to. This is a semi-evergreen shrub (the colder the winter, the fewer the leaves), whose stem tips are furnished with creamy white flowers. Lonicera fragrantissima and L. purpusii Winter Beauty are both worth growing in dappled shade. As they grow to 6ft and higher, it’s tempting to place them at the back of a border, but if you do, you won’t get close enough to the flowers to enjoy their scent. Instead, plant them beside a path where they won’t be a problem in summer, and simply prune out any branches that get in the way. They’re not the shapeliest of bushes anyway, and a little selective pruning improves their posture. In my litany of winter scent, I mustn’t leave out Daphne. Oh, she can be temperamental and short-lived, but while she’s with you is she not fragrant? In my garden, Daphne bholua Jacqueline Postill is a lanky, rather ungainly evergreen shrub, but all is forgiven when her clusters of pink flowers open in Feb-ruary. One sniff, and her figure seems less important. Daphne odora Aureomarginata is shapelier-rounded and with glossy, oval, pointed leaves that are finely edged with cream. The flowers open a month later than Jacqueline Postill’s, but are of the same pale pink and every bit as fragrant. Plant her where her roots can sneak into cool earth under paving and her head can be held in the sun. She’ll reward you for as long as she cares with her heady perfume, and before you know where you are, spring will have arrived.